Since its founding in 1923, TIME Magazine has been one of the most authoritative and informative guides to what is happening in the worlds of health, science, politics, business, society, and entertainment. TIME invited us to co-curate, co-write, and design the twelve-page cover feature for their 2008 year-end “list issue.” It was a delight to work hand-in-hand with such an esteemed editorial team, as we collaborated closely on identifying and creating worthwhile “Top 10” lists, ranging from Food Trends, to Books, to Songs, to Medical Breakthroughs, among others. Hjalti and Jan worked from TIME’s offices over the course of an extended weekend, being plugged in to the magazine’s editorial system with the writing staff, copy desk, and the research team. Over the course of four long days, a series of spreads materialized that would offer the reader an animated reading experience outside the magazine’s grid and type system. 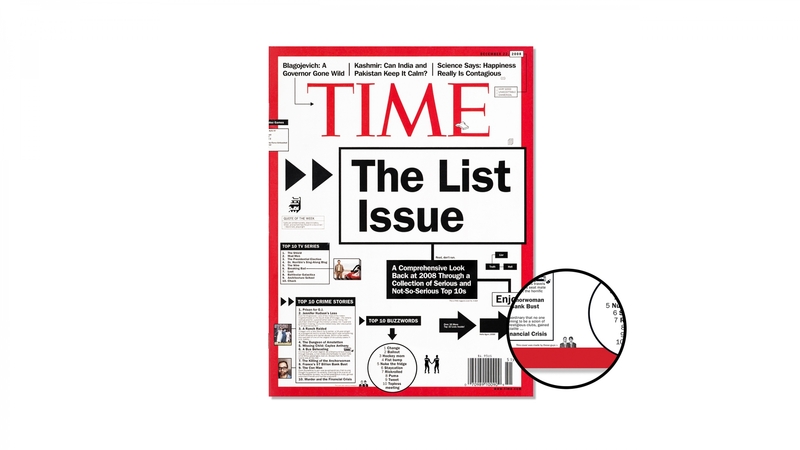 And, if you look at the cover, you can spot Hjalti and Jan in tiny on the very bottom, making Hjalti the first Icelander to have ever appeared on the cover of TIME Magazine, albeit very small. Spreads of the feature article, showing the cutoff "10 Things Lost Forever" on the last page, bottom. We were informed there were letters to the editor advising them to not hire any outside designers that are unable to keep the layout within the margins.